Milwaukee Brewers top prospect Keston Hiura is having a loud spring training campaign with the big league club. The bat-first second baseman boasted a .385 batting average / .407 on-base percentage / .538 slugging percentage entering play on Thursday in 26 at bats. Forget any warning about the validity of spring training statistics, or the context of spring performance, Brewers fans are delighting over the prospect’s performance (much like the praise of third baseman Lucas Erceg during his fantastic 2017 spring training performance). Fan sentiment has the second baseman rushing to the MLB, with many considering Hiura as a potential midseason or late season roster addition, and others insisting that the second baseman could start the 2018 campaign with the big league club. 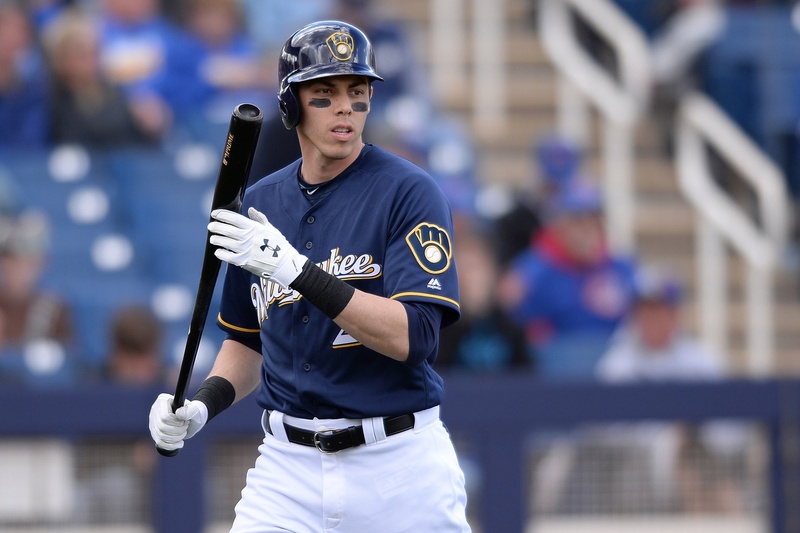 Welcome to the prospect hype, Hiura: after the Brewers traded previous top prospect Lewis Brinson, along with Monte Harrison, Isan Diaz, and Jordan Yamamoto to acquire left fielder Christian Yelich from the Marlins, there is a sense that the system could use a bright spot. Baseball Prospectus dropped the Brewers system from third best (in 2017) to 19th best entering 2018, noting that the slow starts for Trent Grisham and Corey Ray impact the ceiling and risk of the system as much as the Marlins trade. Hiura is praised as a bright spot, however, and claims a rightful spot as the top prospect in the system. One has to wonder if fans wish to compensate from the loss of Brinson by accelerating Hiura, in the hopes that a youth movement can continue to quickly ascend to Milwaukee and add big league development depth to a roster that now has more veteran star power (in the form of Yelich and free agent Lorenzo Cain). What is Keston Hiura’s ceiling? For the Brewers 2018 Top Ten list, Hiura fell immediately behind Brinson with an OFP 70 / realistic 55 grade that cited Rangers prospect Willie Calhoun for both ideal and realistic roles. Willie Calhoun provides an intriguing comparison for Hiura, for the Rangers prospect moved through the minors on the strength of his bat, while shifting between second base and left field in 2017. Calhoun played solely as a left fielder during his brief call up at the end of 2017. There’s no question that Hiura’s strength is his bat, and the position will follow, but the extent to which one digs into this risk will probably define overall feelings about the prospect. Baseball Prospectus emphasizes the risk by listing Hiura as a “2B / DH,” noting: “We’d like to keep talking about his bat but we have to address the defensive concerns that kept Hiura from going even higher in this year’s draft.” The prospect was indeed limited in his defensive role throughout 2017, but that does not preclude grades of his fielding performance: “His throwing motion looks awkward even now, and it’s not impossible he will eventually need Tommy John surgery on his right elbow.” The final aspect of role risk involves a move away from second base, where the pristine bat suddenly comes into question: “He may not have ideal power” to work as a left fielder, which is his logical scouted role after second base. Fans often throw this concern aside, and think of Hiura solely as a second baseman, but there are a few issues worth discussing here. First, it is interesting to note that Hiura may not necessarily be out of the risk zone for elbow surgery, which would certainly impact his development pattern. Brewers fans are inclined to believe that since Hiura did not need surgery once he became a professional, he would not need surgery in the future, which is not a categorical case for the prospect. Second, fans are underplaying Hiura’s defense, and the issues that a shift away from second base would cause: after the Brewers acquired Yelich and Cain, while retaining Ryan Braun and Domingo Santana, a path to the outfield is a probable path to a trade away from Milwaukee for Hiura. The prospect’s outfield path is sufficiently blocked in Milwaukee. Furthermore, if the power does not tick about average, a trip away from second base could diminish the overall strength of the prospect’s profile. Why am I writing this? This is not a knock on Hiura, but rather a concern about how fan perception of the prospect will shape future judgments of the MLB player. Hiura is the best prospect in the Brewers system, and fans need to slow the hype train. This algorithm of “Advanced college prospect, therefore rush to MLB” already impacted fan discussion of Corey Ray in 2017, and there is a sense that spring training hype of Lucas Erceg also unfairly colored fan assessments of his 2017 campaign, too. There is no justifiable sense in which Hiura could, or should, start the season in the MLB; there is little to no justification for rushing the prospect to the MLB prior to the end of 2018. Given that Hiura needs reps against advanced pitching, it is more important for the second baseman to season that hit tool and glove in Class-Advanced A and/or Class-AA during the 2018 season. This type of experience for Hiura should not diminish fan excitement about the prospect, nor should the “risks” of his profile: in fact, fully understanding and embracing the risks associated with any prospect should help to positively inform the strengths of a prospect, too. Once one understands why Hiura could potentially devolve from his most valuable MLB role, the importance of that ultimate MLB role should come into focus. Hiura is not simply a pre-made MLB second baseman destined for success, and this year of development will probably help to define which aspect of his profile appears should he reach the MLB. Once fans embrace this uncertainty, they can fully appreciate Hiura’s role in the system and hopefully return to realistic assessments of the prospect. How should one think about uncertainty of potential MLB roles regarding minor league players? If one begins with the premise that a distribution of historical WARP performances could help to define players’ roles in the MLB level, one could conceivably use that distribution of MLB WARP roles to help define minor league roles. Granted, there will always be imperfections with this type of approach, as prospects ranging from Nolan Arenado to Corey Kluber, or even Jonathan Villar to Brent Suter, will outplay their potential minor league scouting role. Defining the distribution of WARP across MLB seasons should help to explain the likelihood of a player reaching that performance level (at least) and help to form expectations of top prospects (at best). At the very least, taking this largescale view of the MLB landscape should help to redefine common discussions about Replacement Level and WARP expectations. For example, analysts commonly use a range around 2.0-to-3.0 WARP to describe an “average” player; Baseball Prospectus sets “average” to (approximately) 2.0 WARP. Yet, the average WARP across MLB seasons is actually much lower than 2.0, which should speak to the uncertainty of roles in MLB as well as the general attrition that teams face: fielding an MLB team requires numerous replacements for each starter, which naturally diminishes the number of “average or better” WARP performances. There is no “one” replacement player, which is one flaw in common replacement player nomenclature; the fact that teams often require three-to-four players to replace one starter should sufficiently explain why the average historical WARP is much lower than expected. Using the distribution of historical WARP above, one might produce the following grades for each individual season at a particular WARP level. I augmented this distribution with a survey of Expanded Wild Card era minor league players, and estimated that a strict split of professional baseball players would yield roughly 20 percent MLB players (who reach the MLB) and 80 percent minor league players (who never reach MLB). Of course, these percentages are probably compounded by the skewed career arcs that appear at both levels; the average minor league player will not see more than two years of professional baseball, which means that minor league “churn” will probably be much faster than MLB churn. Returning to top prospect analysis, these Overall Future Potential grades and MLB WARP figures should underscore the uncertainty of a player ever producing at the MLB level. Jarrett Seidler’s recent discussion of OFP and percentile outcomes at Baseball Prospectus should be considered required reading prior to another summer of scouting reports and prospect hype, and Seidler’s discussion of uncertainty should bolster this average occurrence of WARP. Returning to Keston Hiura, placing a 70 OFP grade on the second baseman places him in the top 99.9% of all professional baseball players. Of course, scouting reports look at concrete tools, and one would expect a “true” 70 OFP player to have better odds of producing a ~6.0 WARP season; returning to my survey of the 2013 Baseball Prospectus Top 300 class, for example, “70 OFP” prospects reached ~6.0 WARP seasons in two of 90 MLB seasons thus far (see Jose Fernandez and Francisco Lindor), and ~4.6 WARP in six of 90 MLB seasons thus far (see Fernandez, Lindor, Gerrit Cole, Carlos Correa, and Noah Syndergaard). That’s five prospects out of thirty 70 OFP rankings that actually reached the peak heights of MLB performance during their first few MLB seasons; one would expect that number to expand as their careers continue, but the basic discussion should be demonstrative of the rarity of these seasons even among elite ranked prospects. There is simply a scarcity of elite talent in professional baseball (by definition), and due to the attrition of the 162-game season and player development cycles, there are even fewer instantiations of elite WARP seasons in MLB. By the time a player reaches 2.0 WARP, they have accomplished something extremely valuable. We, as fans and analysts, never talk about WARP that way because we do not think about WARP within the full universe of potential replacements who are never called up to the MLB. This should impact how we price elite prospect roles within a system, and it should set our expectations.